We have had a very good Chanukah at JCoSS: its theme of articulating Jewish distinctiveness in the midst of a varied culture are right at the heart of what makes the school tick, and it has been fascinating to explore those issues in our practice as well as in theory. The Jewish people through history have sought to be a light to the nations – and that means being among the whole of society, speaking in ways that can be understood. But it also means guarding the unique light and keeping it carefully so it can be passed from one generation to another – which is the literal meaning of “tradition”. 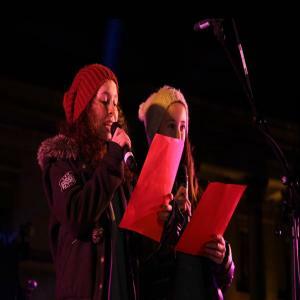 The party of staff and students who went to Chanukah in the Square saw that in action – and Indigo Smith and Rebecca Saunders (both Year 8) articulated it perfectly to the assembled thousands from the podium. (see picture) The whole school saw it as we gathered around our new outdoor Chanukiah last Thursday; parents and friends saw and felt it too in the moving Chanukah Concert the same evening; and the same issues were given a good airing and debate at the Rosh Chodesh session I went to on Friday morning, exploring what makes Jewish music Jewish. Our students “get” these issues well and it is exciting to be part of the process of teasing them out. If only I had known, as I shook the hand of Boris Johnson at Trafalgar Square last Monday, that he had just written personally to Zoom Rockman (also Year 8) who won a highly prestigious “Spirit of London” Award for Achievement in Media. Zoom’s cartoons have caught the public imagination this year and he has won international recognition for them – as well as being on the Vogue.com Top 100 Hot List of “People to watch out for in 2013”. We will certainly be doing so. As well as their achievements on the public arena our students have been doing well in school too. Our new system for logging behaviour has yielded some impressive data: students have clocked up 35499 achievement points over the term. The ratio is 6 to 1 of good work and Menschlich behaviour as compared to those occasions where we have to pull them up – usually for relatively minor things. We are heartened by the statistics and very pleased with the students. Early in the New Year we will move forward in our partnership with parents by publishing Curriculum Booklets, one for each year, setting out a summary of what students are learning in each subject, how much Home Learning they should expect, what assessments they will face and how parents can help them. We know there is huge willing amongst parents to support children’s learning and we hope this will make that easier. With very best wishes for the holidays, and looking forward to the return of the sunlight!